At his arrival on boulevard F.D. Roosevelt, HRH the Grand Duke was greeted at the foot of the monument at Boulevard F.D. Roosevelt by the President of the Chamber of Deputies Mars Di Bartolomeo, the Prime Minister and Minister of State Xavier Bettel, the Deputy Prime Minister and Minister of Defence Etienne Schneider, the Mayor of Luxembourg City Lydie Polfer, and the Army Chief of Staff General Alain Duschène. 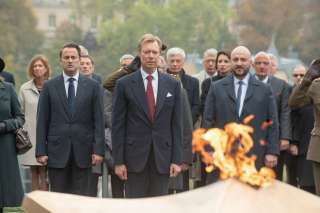 The Head of State HRH the Grand Duke laid a wreath at Luxembourg's National Monument of Solidarity ("Kanounenhiwwel") and rekindled the flame of remembrance. 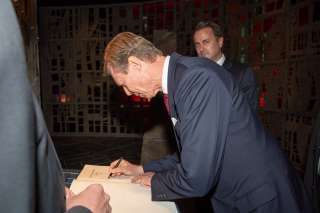 He then went inside the monument to sign the guestbook. 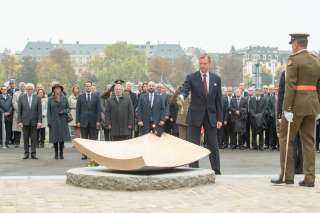 Outside the monument, HRH the Grand Duke greeted the flag bearers, the Luxembourg authorities, the ambassadors in Luxembourg, and members of the Committee for the Remembrance of the Second World War, composed of representatives of the Resistance, forced conscripts and Holocaust victims. Following the ceremony at the National Monument of Solidarity, wreaths were laid at the Monument in Memory of the Holocaust Victims on boulevard Roosevelt in Luxembourg. 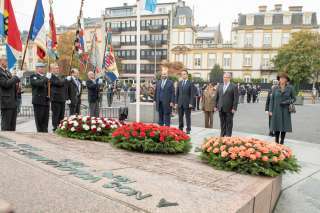 The wreaths were laid down by the President of the Chamber of Deputies Mars Di Bartolomeo, the Prime Minister and Minister of State Xavier Bettel, the Mayor of Luxembourg City Lydie Polfer, and the President of the Israelite Consistory, Albert Aflalo. 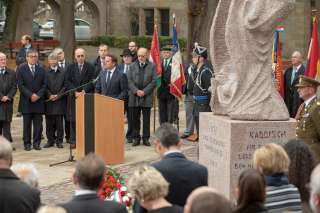 The speech and the prayer by the Great Rabbi of Luxembourg, Alain Nacache, were followed by a speech by Prime Minister Xavier Bettel. Wreaths were laid at the Monument of Remembrance on the Place de la Constitution by the President of the Chamber of Deputies Mars Di Bartolomeo, the Prime Minister and Minister of State Xavier Bettel and the Mayor of Luxembourg City Lydie Polfer, in presence of Deputy Prime Minister and Minister of Defence Étienne Schneider, the Army Chief of Staff General Alain Duschène and the Director-general of the Grand Ducal Police Philippe Schrantz. 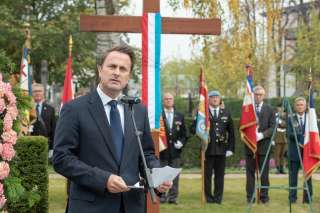 Prime Minister Xavier Bettel held a speech at the National Resistance and Deportation Monument. A representative of the Catholic Churche, Vicar General Léo Wagner, the Great Rabbi of Luxembourg, Alain Nacache and the pastor of the Protestant Church of Luxembourg, Volker Strauß, then proceeded to the blessing of the tomb at the National Monument of the Resistance and Deportation ("Hinzerter Kräiz"). 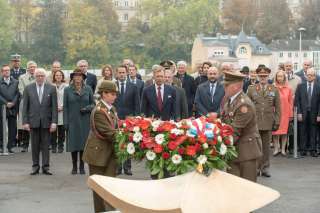 Flowers were laid by Mars Di Bartolomeo, Xavier Bettel and Lydie Polfer. 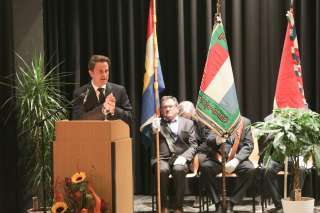 A commemoration and remembrance ceremony was celebrated at the Lycée classique of Diekirch, in presence of the President of the Chamber of Deputies, the Prime Minister and members of the government, national authorities, ambassadors, the Committee for the Remembrance of the Second World War and students. The ceremony included addresses by Mars Di Bartolomeo, Xavier Bettel, the headmaster of the Lycée classique de Diekirch, Marcel Kramer, the mayor of the city of Diekirch, Claude Haagen, and the Chairman of the Committee for the Remembrance of the Second World War, Josy Lorent. There was also a musical accompaniment by the choir of the Lycée classique de Diekirch, soprano Danièle Patz and saxophonist Nadine Kaufmann, as well as the scenic reading of texts selected by high school students. Press release by the Information and Press Service of the Government.